Playing basketball at the collegiate level is far different than high school and making that transition is extremely difficult. 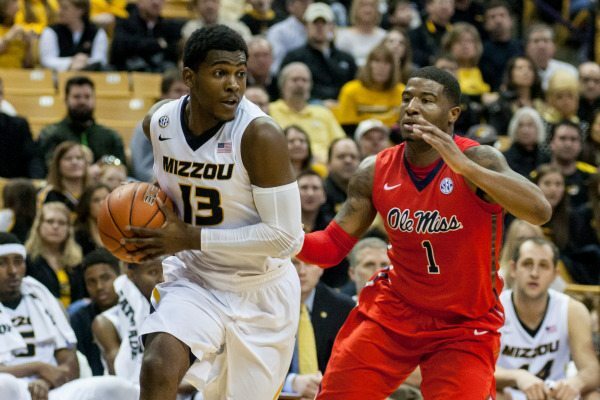 The Missouri Tigers and their freshman-laden lineup are learning just how hard that transition can be. After coming off a hard fought loss on Thursday to the top ranked Kentucky Wildcats the Tigers dropped their seventh straight game Saturday to the Ole Miss Rebels 67-47. The 20-point loss marked the largest defeat Missouri has suffered at home since losing to Kansas in 2010 77-56. After coming off a career high 19-point performance against Kentucky Wes Clark registered a mere eight points and two assists. Johnathan Williams III led the Tigers with 14 points, while Stefan Moody of the Rebels led all scorers with 23. Missouri momentarily took the lead midway through the first half when Clark connected on three-point jumper to give the Tigers a 13-12 edge. However the Tigers continue to struggle behind the arc as they were only able to hit 23 percent of their three-point attempts. Ole Miss retook the lead for good minutes later as Anthony Perez drained a three-point shot to give the Rebels a 17-15 advantage. Perez’s three triggered a 20-10 run for the Rebels giving them a 37-25 lead heading into the break. Not much went right for Missouri in the second half as it failed to connect on shot after shot after shot. All in all the Tigers took 63 shots, but only 19 of those found the bottom of the net. It certainly makes it hard to win basketball games when the ball isn’t going in the cup. The Rebels on the other hand, shot a solid 45 percent from the field and converted on 15-18 free throws. Ole Miss continued to execute down the stretch en route to its fourth win in the past five games. With the win the Rebels remain in the middle of the SEC with a conference record of 5-3, while Missouri sits in the basement with a conference worst record of 1-7. The Tigers haven’t been able to catch any sort of break lately. It’s always difficult to turn around coming off a big game on short rest. It’s clearly apparent that Missouri put a lot of effort into the game against Kentucky after being blown out in the previous meeting, which resulted in a lack of preparation Saturday against Ole Miss. The Tigers were also stuck with a short bench due to the absence of Tramaine Isabell, who was inactive due to his poor behavior on the court, according to Missouri head coach Kim Anderson. The atmosphere surrounding Missouri basketball remains bleak with the team in its longest losing streak since the 1992-1993 season. Though how the Tigers finish out the remainder of the season and how they play on the court will tell a lot about what the future of this team will be like. Anderson certainly seems to have a handle on players such as Isabell, who aren’t buying in and I remain hopeful for the seasons ahead. Win as a team; lose as a team simple as that. The Tigers are next in action on the road at Alabama Feb. 4.